There are hardly any fan bases more passionate than that of the Winnipeg Jets. The team that packed up and left in 1996 returned in 2011 to a city thirsty for an NHL franchise, and the result has been one of the strongest followings around. Technically they were two different franchises, but we’re thinking that the fan base probably overlaps pretty heavy. 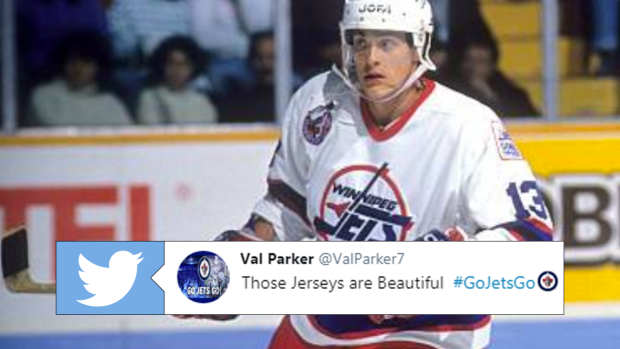 That’s why Jets fans are so excited with the Jets’ latest announcement – for two nights in the 2018-19 season, Winnipeg will be taking the ice wearing these awesome throwback jerseys. #NHLJets will wear @adidashockey adizero Authentic Pro Heritage jerseys (available Friday) on Alumni Night. It will be the second of two appearances of the Heritage jersey this season, the other being at the Dec. 31 away game vs. the Oilers. They aren’t exactly the same, but they’ll certainly remind fans of a time before the team left, when legend Teemu Selanne was still playing for the team. The heritage jerseys are being received much better than the Jets current alternative jerseys, the baby blue threads that were met with wide criticism over the off-season. How did the Jets decide on that baby blue eyesore over these perfect jerseys. Possibly the best jerseys ever, these should be the main jerseys for sure. YES!!! Finally!! These should easily be the 3rd Jersey or even main jerseys but we'll take the two games for now, please change for next season!! These should be your jerseys. Period. A no brainer here people. THIS IS WINNIPEG! Now THIS is a hockey sweater.